Our crews here at LA Pavers have been creating outdoor spaces that are as functional and appealing as they are durable. We are the company to hire if you have outdoor improvement projects that involve paver walks, patios and driveways. Our skilled manpower has transformed countless landscapes in Harahan, Mandeville, Covington and Slidell, LA. The outdoor features that we create inspire moments of relaxation and offer property owners a source of pride and joy for many decades. Call us at 504-731-8755 to inquire about our rates or know more about our paver design and installation services. At LA Pavers, we have over three decades of experience installing custom-designed paver walks, patios and driveways. We offer customized digital designs of the above-mentioned paving projects, so you can enjoy a sneak peek into the actual structures when done. All our creations are highly unique paver amenities and built according our client’s needs and design taste. Additionally, we observe careful installation of every paver feature that we create to meet the requirements of the project and avoid back jobs. Walks: Paver walks are vital features in your landscape, so we always create a well-designed walkway plan. We use slip-proof pavers when building them to avoid accidents in the area. We typically use concrete pavers and stone paving since they have natural slip-resistant textures. Our design and installation teams will create paver walks that will complement with your property’s other features. Patios: We have created stunning paver patios that are complete with our clients’ desired amenities. Among others, we can add fountains, fire pits/fireplaces, sitting walls, outdoor furniture, canopy, pocket gardens, and practically any add-on that the clients need to make their stay more comfortable and enjoyable. 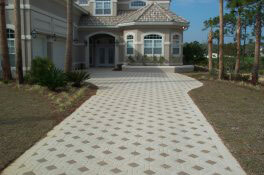 Driveways: Allow us to create a great first impression among guests by creating a one-of-a-kind paver driveway. We will ensure proper site preparation like excavation and grading to guarantee hassle-free installation. We’ll also use top-caliber pavers so your driveway will last a lifetime without requiring costly repairs. Your paver driveway will become a focal point in your property and serve as a functional aesthetic addition to your landscape. With us, our clients are guaranteed of excellently done paver walks, patios and driveways. Our certified paver installers strictly follow proven installation methods, work on creative designs, and use only top-quality pavers. Since we have dedicated professional crews and not just sub-contractors, clients are assured that our focus is on their property alone. This lets us follow project details down to the smallest specifications, thus guaranteeing fast project completion and 100 percent adherence to the requirements of the job. The results are paver features that transform plain outdoors into areas perfect for rest and relaxation. The best thing about hiring us is that you don’t just get extraordinary landscape structures, you also enjoy competitive pricing. Our rates are truly within clients’ budget, so no worry about spending a fortune just to realize your desired paver walks, patios and driveways. Please contact us soon and let’s discuss your project requirements.